We were just sent what appears to be a legitimate internal memo floating around BestBuy’s systems. 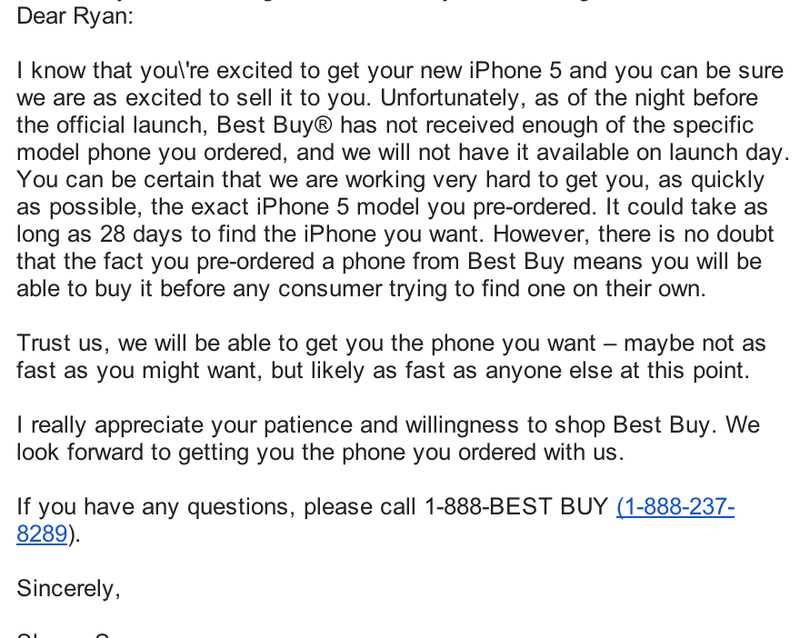 It confirmed the retailer would not fulfill all iPhone 5 pre-orders based on “current inventory allocation.” Originally expected for delivery by today, the memo confirmed BestBuy sent emails to some customers informing they will not receive the pre-ordered iPhone 5 by this weekend. Instead, BestBuy is promising to fulfill preorders by mid-October—”no later than 28 days from launch.” Shipping times for the device slipped to “3-4 weeks” even on Apple’s website, but this is confirmation from a major retailer that some pre-order customers promised delivery by this weekend will not get their device. We recently posted documents showing Walmart’s internal iPhone 5 launch plans, which confirmed the retailer will also not guarantee Sept. 21 availability for preorder customers.